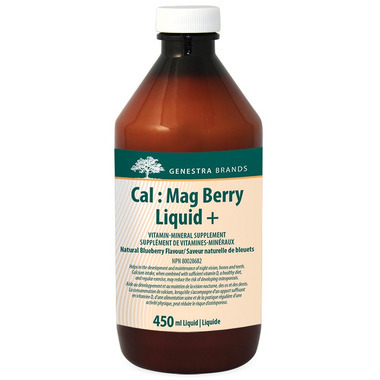 Genestra Cal : Mag Berry Liquid + is a comprehensive bone support formula with 100% citrate minerals. Calcium citrate is an organic form of calcium that is significantly better absorbed in postmenopausal women than inorganic calcium oxide. Magnesium citrate is a highly bioavailable form of magnesium that helps to maintain bone mineral density: in healthy young men, regular magnesium supplementation has been shown to suppress bone turnover rates. In vitro osteoblast studies indicate that boron stimulates production of several proteins involved in maintaining bone structure, including type 1 collagen, osteocalcin and osteopontin. In human participants with osteroporosis, supplementation with the plant-based boron compound calcium fructoborate was found to improve bone density. Insufficient vitamin K intake may increase bone fracture risk, and vitamin K supplementation has been shown to reduce bone turnover and improve bone strength. My sister got me, my mom and my Aunt onto this calcium. After hearing my sisters bone test came back with improvements I jumped on bored! I take it with a liquid vitamin D.
I take a large spoonful of Genestra Cal every night before heading to bed. Not only is it delicious, but it makes me sleep so well. Tastes good, very tangy. No chalkiness.